The selected translations listed below are listed in the order of the name of the original author. BAHR, Hans-Dieter, (1981) ‘The class structure of machinery’ in Phil Slater (ed. ), Outlines of a Critique of Technology, Inklinks, London. BÖHME, Gernot et.al. (1983) The Social Orientation of Scientific Progress, Reidel, Dordrecht. EUROPEAN COMMISSION, Equality Network, (1984, 1985) Reports of the EEC Equality Network. FRITZ, Markus, (1981) The Future Energy Consumption of the Third World, Pergamon, Oxford. 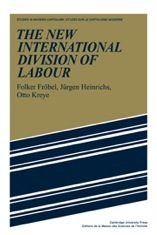 FRÖBEL, Folker, HEINRICHS, Jürgen, KREYE, Otto, (1980) The New International Division of Labour, Cambridge University Press, Cambridge. FRÖBEL, Folker, HEINRICHS, Jürgen, KREYE, Otto, (1979) ‘The effects of international developments on domestic economies and social developments in developing countries’, Max Planck Institute, Starnberg. FRÖBEL, Folker, HEINRICHS, Jürgen, KREYE, Otto, (1989) The Economic Impact of Sanctions against South Africa (with a foreword by Sir Shridath S. Ramphal), Nehanda Publishers, Harare. FRÖBEL, Folker, HEINRICHS, Jürgen, KREYE, Otto, (1985) ‘Changing patterns of world market integration of developing countries’, paper given at the VII International Colloquium on the World Economy, Dakar, May, 1985. FRÖBEL, Folker, (1982) ‘The current development of the world economy’, Review, Spring, 1982. FRÖBEL, Folker, (1983) ‘Economic policy in the crisis’, paper given at the ‘Internationalisation and Industrialisation of the Periphery’ Conference, Mexico City, January 1983. 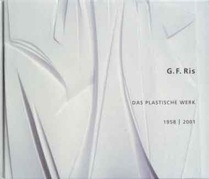 GOESCHEL, et.al. ‘Infrastructural inequality and segregation theory’, International Journal of Urban and Regional Research, Vol. 7 (1983). GROSSMANN, Henryk (1977) ‘Classical political economy and the problem of dynamics’, Capital and Class, 2 and 3, 1977. 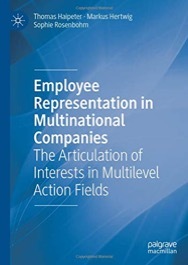 HAIPETER, Thomas, HERTWIG, Markus, ROSENBOHM, Sophie (2018) Employee Representation in Multinational Companies: The Articulation of Interests in Multilevel Action Fields. Palgrave Macmillan. HANSEN, Reimer (1995) ‘Germany’s Unconditional Surrender’, in History Today, Vol. 45 (5), May 1995. HAUSER-DITZ, Axel et al. 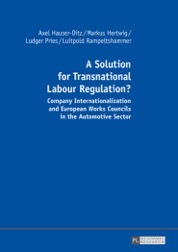 (2016) A Solution for Transnational Labour Regulation? Peter Lang. HIRSCH, Joachim (1978) ‘Political repression in West Germany’, International Journal of Urban and Regional Research (1978). 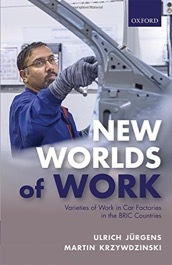 JÜRGENS, Ulrich and KRZYWDZINSKI, Martin, (2016) New Worlds of Work: Varieties of Work in Car Factories in the BRIC Countries. Oxford University Press. 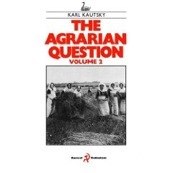 KAUTSKY, Karl (1988) The Agrarian Question, Pluto Press, London. KOHL, Heribert and PLATZER, Hans-Wolfgang (2004) Industrial Relations in Central and Eastern Europe, Brussels. KOTTHOF, H. and WHITTALL, M. (2014) Paths to Transnational Solidarity, Peter Lang: Oxford. KRAUSE, Ulrich (1982) Money and Abstract Labour, Verso, London. KREYE, Otto and CASTELL, Lutz, (1991) Development and Environment in Papua New Guinea: a study on the impact of gold mining on social structures, prospects for development and the environment, Evangelical Lutheran Church, Bavaria, Starnberg. LECHER, Wolfgang, NAGEL, Bernhard, PLATZER, Hans-Wolfgang et.al., (1999) The Establishment of European Works Councils, Ashgate, Aldershot. LECHER, Wolfgang, PLATZER, Hans-Wolfgang, WEINER, Klaus-Peter et.al. (2000) European Works Councils: Developments, Types and Networking, Ashgate, Aldershot. LECHER, Wolfgang, and PLATZER, Hans-Wolfgang, RÜB, Stefan, WEINER, Klaus-Peter, (2002) European Works Councils: Negotiated Europeanisation, Ashgate, Aldershot. LECHER, Wolfgang, and PLATZER, Hans-Wolfgang (eds.) (1998) European Union – European Industrial Relations?, Routledge, London. LECHER, Wolfgang (ed.) The Trade Unions in the European Union, (1994) Lawrence & Wishart, London. LÜDTKE, Alf, (1989) Police and in State in Prussia: 1815-1850, Cambridge University Press, Cambridge. PLATZER, Hans-Wolfgang and MÜLLER, Torsten (2011) Global and European Trade Union Organisations, Peter Lang: Oxford, Berne, Berlin, Brussels, Frankfurt. MEZGER, Dorothea, (1980) Copper in the World Economy, Heinemann Educational Books, London. OLLE, Werner and SCHOELLER, Wolfgang (1982) ‘Direct investment and monopoly theories of imperialism’, Capital and Class, 16 1982. ROSDOLSKY, Roman (1977) The Making of Marx’s ‘Capital’, Pluto Press, London. RÜB, Stefan (2002), World Works Councils and Other Forms of Global Employee Representation in Transnational Undertakings. A Survey, HBS-Arbeitspapier 55, Düsseldorf. RÜB, Stefan, PLATZER, Hans-Wolfgang, MÜLLER Torsten, (2013) Transnational Company Bargaining and the Europeanization of Industrial Relations. Peter Lang: Bern. RÜB, Stefan, PLATZER, Hans-Wolfgang (2016) The Europeanization of Industrial Relations in the Service Sector, Peter Lang: Bern. WEBER, A. (1909/1982) ‘On the location of industries’, Progress in Human Geography, Vol. 6 (1), 1982. Extracts from Über den Standort der Industrien, Verlag J.C.B. Mohr, Tübingen. WEYL, Uli (1981) Labour Migration in Malawi, Göttingen. ADDO, Herb et.al., (1985) Development as Social Transformation, Hodder & Stoughton, London. ITOH, Makoto, Value and Crisis, (1980) Monthly Review Press, New York, London. KELLER, Berndt and PLATZER, Hans-Wolfgang (eds. ), (2003) Industrial Relations and European Integration, Ashgate (London).